A first timer’s highs and not so highs! Not knowing what to expect with regard to heat, walking around the parks all day and crowds, it was nice to know, that even as a plus size lady, I coped much better than I was expecting. I’m glad to have lost the weight that I did, and by the time we go back again I’ll be at my goal weight. I’d planned in a lot of rest days because I was panicking we’d burn out and miss more if we didn’t, but they weren’t needed really, and so we were in the parks all day – we didn’t need to have a break during the day as I thought we might do. The crowds weren’t as huge as I was imagining, and the queues were no where near as bad as I was expecting either. We really got into our stride by about 10 days in, and I was panicking that we hadn’t done enough! We stayed in a Villa in Tuscan Hills which is off the 27 and very close to Disney (about 10/15 mins). I drove all through the hols, we had two cars – one from Alamo through Virgin, a Chevrolet HHR and the other from Budget through USRentaCar, a Chevrolet Impala. The only shopping we did was at Downtown Disney and a quick visit to Premium Outlets (I think we went to the Vineland Road ones) and the factory outlets (LBV). Smooth Flying. I’m not the best of flyers, so was very tense boarding the plane. I was happy not to need a seat belt extension, having lost 5 stone before going to Orlando, so that put me on a high. The In Flight Entertainment on the new A330s was fantastic. My son, who has his DSi glued to his hands usually, didn’t even look at it for the whole flight! What with the films on offer, TV shows and games, he was thoroughly entertained. The take off was smooth, the flight over, smooth, the landing smooth. Even though we were the last row, and last off the plane, and pretty much last through immigration, we took it all in our stride, and our transition through MCO was easy peasy, no stress, no fuss and I would quite happily fly back into that airport. We did online check in for the car, so just had to go through to the car park and choose a car and drive out. My son embracing it all. I was really worried about him at Disney. He’s at that funny age (12) where things are babyish and he’s not been interested in Disney for a while now, but after he saw his first parade (at Hollywood Studios) and commented how he wished the parade had lasted longer, I knew I had him hooked!! He absolutely loved meeting the characters, and was happy to queue up to get an autograph and a photo. My long awaiting to be filled autograph book that I made way back in 2003 has got a lovely little collection of signatures and I’m so glad I brought it along with us. Serengeti Safari at Busch Gardens. We bought this whilst in the UK. It was $36pp, which in my mind was amazing value for a fantastic up-close encounter with the giraffes. I loved every second of it, and would go back to Busch Gardens to do that alone! 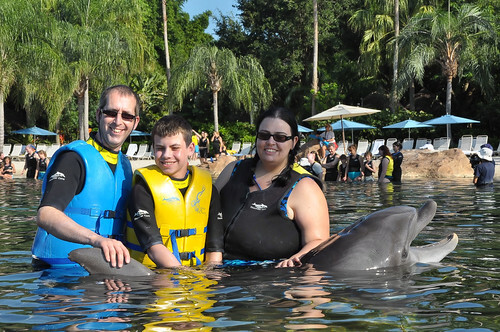 Dolphin Swim at Discovery Cove. Another animal encounter and absolutely enchanting! When we stroked our old-timer dolphin, Capricorn, he didn’t feel at all how I was expecting – kinda spongey lol, and this part of the day was over all too quickly. Tusker House character breakfast at Animal Kingdom. After a disappointing meal at Hollywood and Vine, we ended up cancelling a lot of the ADRs we booked, but kept this one, and glad we did! Whilst Donald doesn’t come round and meet you, Mickey, Goofy & Daisy do (maybe Minnie too, but we didn’t see her) and they had a lot of time for each table. The breakfast was great and we got to have our Mickey waffles lol. My son particularly enjoyed tater tots and his plate was piled high with them! Bahama Breeze on the 192 was great – we went there three times! Teppan Edo, you do pay for the show of the chef, which was very entertaining, and the food was good. Great fun and would go again.Sharks Underwater Grill. Pricey, but such lovely food – best steak I’ve ever eaten, and the ambience was very relaxing with the aquarium as a backdrop. Would go back. Sonny’s Pit BBQ – after us all wanting to try American BBQ after watching so much of it on Diners, Drive Ins and Dives on the Food Network here in the UK, we weren’t disappointed, and the drinks were humungous – must have been 2 pint glasses! Aquatica was brilliant. It was the only water park we managed to do, but my son thoroughly enjoyed himself, and the $15 all day buffet was good value. We only meant to go there for the morning, but ended up spending the whole day there! The Roa Rapids were such fun, and we must have gone round them about 20 times lol. 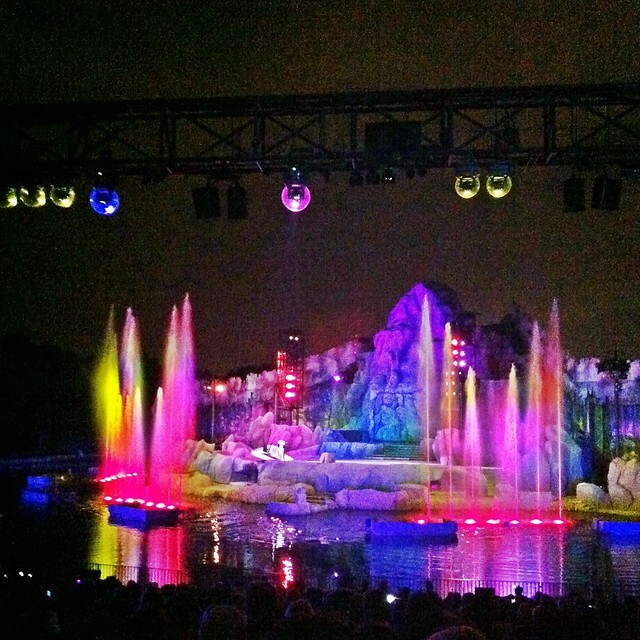 Shamu…rocks! (and not just the show!) I used to love the killer whale shows at Windsor Safari Park when I was a kid, and seeing Shamu and the rest of the gang was wonderful. As this was our first time, we didn’t know any better with regard to trainers being in the water with the whales, so we didn’t know what we were missing in that respect – both ‘One Ocean’ and ‘Shamu Rocks’ were delightful. I had a little tear in my eye for both, but that’s cos I’m an emotional cry baby and I was really emotional when I heard Savage Garden’s ‘Animal Song’ as one of the tracks for Shamu Rocks, since they are one of my all time favourite bands. Silly, I know. 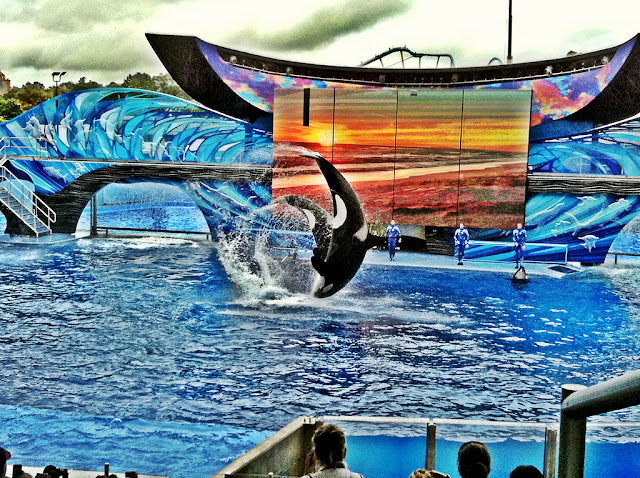 To be fair, all the shows at Seaworld were brilliant! Driving on the wrong side of the car and road was wicked! I loved every second that I drove out in the States, and apart from a couple of hairy left turns (more will be in my trip report! ), it was a breeze. We didn’t encounter any major traffic jams, and any traffic we did encounter (which was rare) moved along steadily and nothing compared to the jams I experience in London and on the M25. Give me the I4 over the M25 any day of the week! I’m gutted to have to be driving in the UK again lol. I hate it!!!!! Juno Rocket Launch. 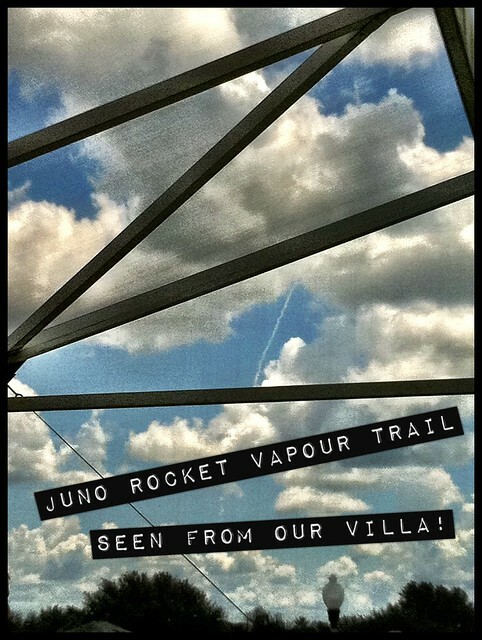 Now sadly, for one reason or t’other, we didn’t get to Kennedy which hubs so wanted to do, but on our first full day was the Juno Rocket Launch and we saw the vapour trail from our villa – now I’m pretty sure you can probably see that from most places, but it was so cool to see! Other fantastic things seen from our villa were hot air balloons at sunrise, amazing lightening forks, an aeroplane sky writing and a bird of prey of some sort often circled above. We also saw an armadillo scurry by as we left the complex through the gates – fantastic! Great Rides, for us as a family, included Star Tours, The Simpsons Ride, Kali River Rapids, Test Track and The Amazing Adventures of Spiderman. 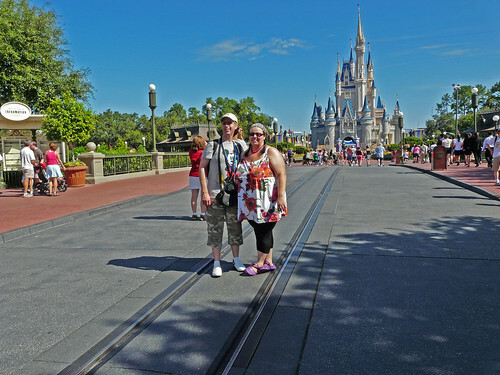 As we walked down Main Street and the castle came closer into view I just couldn’t believe we were there – even though, by this point, we had been in Orlando for 2 weeks! Watching Dream Along with Mickey on the stage in front of the castle was a big tear jerker for me, I get really swept away by music, and I was sobbing these big tears! Silly, I know! We didn’t see much of Magic Kingdom on this day because of the rain, but came back for the night time parade and Wishes fireworks, and not even the monorail breaking down and everyone piling onto the ferry boat at the end of the night could spoil that day for us. Being ill :'( for the first week with the most horrid (wo)man flu was such a crappy start to the holiday. I NEVER get colds, and to get one as we jetted off to Orlando was so annoying. It mean taking things quite slow in the first week, which I guess had a knock on effect, meaning we didn’t do some of the things we had planned to do. Hubs also had a dicky tum on one of the days – he says it was sugar overload from the butterbeer in Hogsmeade, I think it was the Ponderosa breakfast, but either way, it was a day of doing nothing but him sleeping and the boy and I messing around in the swimming pool. Discovery Cove. Probably a surprise for most to see this in the not so highs. Don’t get me wrong, the dolphin swim was wonderful and I loved swimming in the Grand Reef. But everything felt so rushed – an early swim at probably the wrong time (8:40) had a knock on effect to everything else – breakfast was close to finishing so things were running out, a late breakfast meant a late lunch with stuff running out again, and the queues were huge. They ran out of Bud Light when hubs went to go and get a bottle. The food was no better than going to Golden Corral (IMO) and I guess I was expecting more. It wasn’t the relaxing day that I had imagined, and I’m absolutely gutted that DC didn’t live up to my expectations. A thunderstorm loomed towards the end of the day, which meant they shut the lazy river and we ended up leaving at around 4ish I think. I don’t know if we would do it again based on our first experience there, but I know so many people do love it, so perhaps I would give it another chance. We’ll see – I know hubs was less than impressed, and it was probably a bit too tranquil for my 12 year old son. Ponderosa on the 192. We went there for breakfast and it was pretty grim. We didn’t go back for dinner! Not fitting everything in, despite going for 3 weeks we didn’t do everything we had planned to…a combo of weather conditions and being ill at the start – but it’s a great excuse to go back! Being plus size meant that some rides were off limits for me – notably Forbidden Journey, which I was expecting anyway, but I tested the seat to make sure and it was having none of it :( carrying my flab round my middle didn’t help. I insisted hubs and son to go on, but they didn’t want to do it without me. And The Mummy Ride – no matter how much I sucked it in, it wasn’t going to happen – gutted! I didn’t bother to try for the over the shoulder type rides as I just didn’t want the shame of queuing and not being able to ride, but they’ll all be on the list for next time, I can promise myself that! The storms. I was expecting rain, but I guess with Irene heading in the direction of Florida, it brought more rain than normal – I don’t know. It didn’t spoil things per se, as you just don the ponchos, and put your best of British foot forward – but it cancelled the parade at AK for us and the lightening closed Expedition Everest when we were there, and we didn’t get the chance to go back to see/do them again. It washed out the ‘Celebrate a Dream Come True Parade’ at MK, but the parade had started so they soldiered on – we again, didn’t get a chance to go back and see it in the dry :( It nearly cancelled Fantasmic – and from the boos from the crowd, if it had been cancelled there would have been a riot! I’m so glad they didn’t owing to the dire H&V experience! 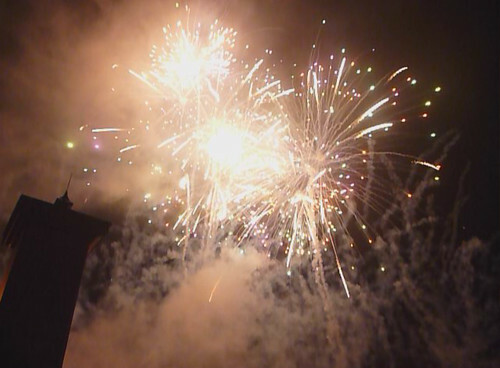 It rained during the Epcot fireworks, and that was touch and go if that would go ahead, but we stuck it out and they were fab. The flight home was turbulent – owing to Irene. It felt like the seatbelt lights were on for the whole flight and I’ve never wanted to get home so quickly from a holiday in my life! I had a major panic going on and a lovely steward was very reassuring. The wind helped us along and I think we got back in under 8 hours. Oh, and the food coming back was just rank! You were stuck if you didn’t like fish or curry! Especially compared to going – but it’s plane food, it’s never going to be decent lol. And finally, leaving…we had an amazing holiday, and saying goodbye to Orlando was sad. We are already planning a second trip for 2013 and knowing what we know now having been will make it a great trip to plan! TL:DR – lots of highs, some not so highs! A great first time in Orlando and already planning on returning!